A part of the Giza pyramid complex, the Sphinx is a massive statue of a seated lion with a man’s head. 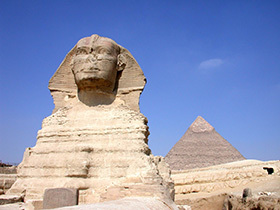 Though some have disputed the identity of the man, it is generally accepted that the Sphinx is meant to represent the pharaoh Khafre. It is carved from the bedrock at the base of the causeway to Khafre’s Valley Temple. The lion was a symbol of the sun as well as power and kingship. On the statue of the Sphinx, Khafre wears the nemes headdress, which not only symbolizes kingship, it also keeps the head in proportion to the lion’s body. There was a temple built for the Sphinx, however it was never finished and was possibly never used. The Sphinx has been restored often in both ancient and modern times. The first and possibly most famous restoration occurred in the New Kingdom under Thutmose IV. He cleared the sand from around the base, repaired damage to the body, and commemorated his work with a small chapel and a stele (plaque) placed between the Sphinx’s paws. Thutmose IV, in his “Dream Stele,” relates that as a young prince, the Sphinx appeared to him in a dream, promising that if he would clear away the sand and restore the Sphinx, he would become the next pharaoh. This eventually happened. Further repairs were carried out in the Twenty-sixth Dynasty and the Greco-Roman Period. Modern restoration work under the Egyptian Antiquities Service began in the 1940s and continued until recently. Image: The Great Sphinx of Giza. Taken by the Rosicrucian Egyptian Museum.